Amazingly, the majority of headaches are caused by having a "bad" bite. If the teeth don't come together in an optimal bite, the result is sub-conscious clenching or grinding of the teeth. This causes pain in the muscles of the head, face and neck. Almost no one realizes they have a bite that is not correct or that they are grinding. Many patients say their spouse never hears them. The problem is that adults don't make noise grinding like children do. If you grind right now, chances are you will not make noise. Bruxing is the name dentists give to this abnormal activity of grinding. Over time bruxing leads to muscle pain and jaw joint problems. This is known as TMJ syndrome. A common symptom for women resulting from muscle fatigue and TMJ breakdown include headaches – often of migraine severity – behind the eyes and/or in the area of the temples. Men experience less headache and more neck stiffness or soreness. Neck stiffness almost always accompanies TMJ syndrome. 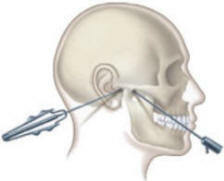 The clicking or popping noise in front of the ear is the jaw (tempromandibular) joint breaking down. The noise is the cartilage in the joint that becomes permanently deformed from prolonged overuse. There may also be soreness in the muscles of the face and jaw in this area due to overworking them. Ear congestion or ringing is another common sign. Bruxing is a most destructive habit. The joints, muscles, and teeth are in conflict. The teeth become worn and can be cracked or will shift from the forces of bruxing. The enamel can flake off at the gum line causing notching on the teeth receiving the most excessive forces. Neuromuscular dentistry is treatment focused on creating harmony between the joints, the muscles and the teeth. Excessive wear can even deform the smile or shorten the teeth to the point the person looks like the have a denture. A cardiologist checks for heart disease with an EKG. It is a computer that measures electrical activity in the body. We use a similar computer, an EMG or Electromyograph, to measure muscle activity in the head and neck as we are tracking your jaw position. With this study we can determine the optimal jaw position for you and make a special mouthpiece at that relaxed jaw position. This is a major breakthrough in TMJ and migraine headache therapy because we can make these precise measurements. In the past dentists realized the bite was the problem but didn't know where the bite should be. Many mouthpieces were made using an arbitrary bite because we had to guess at relaxed muscle position. Sometimes they worked, but often they would not relieve the pain. A mouthpiece made with the aid of the computer to the relaxed muscle positions is called a neuromuscular orthotic. When the pain goes away with this mouthpiece, you know with certainty that your bite was causing the problem. The orthotic stops the pain, and returns the mouth to a stable, comfortable position.